A steep price tag isn’t always a guarantee of a well-tested product, and here’s a corporate blunder that proves it: Montblanc has issued a massive recall after discovering that its line of luxury pens could be used to sign over an heiress’ fortune to a deceptive young lover with murderous intent. 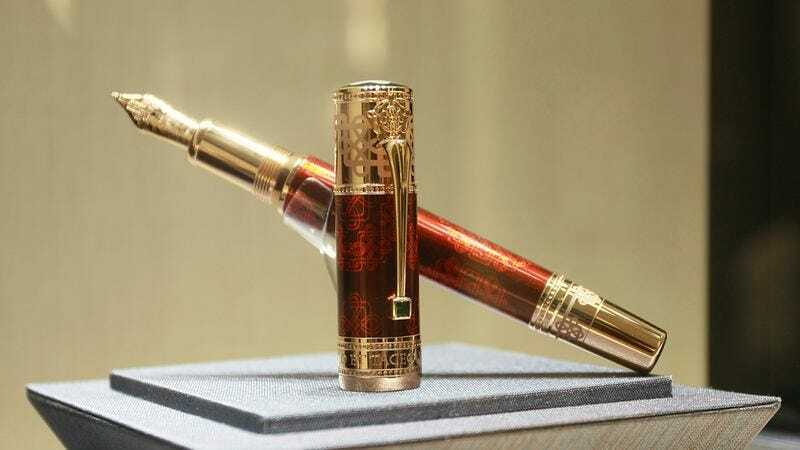 Montblanc announced the recall on its website earlier today with an urgent plea for customers to send back their pens immediately before a charming yet enigmatic rogue woos a high-society heiress into using it to sign a legal document that promises him her inheritance in the event of her untimely demise. The recall applies to every single style of pen sold by the company, with its rollerball models proving particularly risky due to the mechanical ease with which they can sign away an unsuspecting young lady’s riches after a whirlwind evening of clever innuendos and smoldering glances at the duchess’ ball. In hindsight it’s easy to see how a devilishly handsome young stranger who neatly deflects any inquiries about his past could use a Montblanc pen to make himself the sole beneficiary of a lovestruck heiress’ will. He might then suggest they retire to her chateau’s bedchambers, especially after he learns how the room opens onto a precipitous balcony that is well-known to become dangerously slick after rain. Assuming the heiress doesn’t put together the telltale oversights of his hands so uncharacteristically calloused for a nobleman or the incorrect initials sewn on the inside of his dinner jacket, that mistake could be her last, and you can bet Montblanc realizes just how disastrous that would be for its brand. At the very least, Montblanc has shown it’s committed to making this right: The company will be offering full refunds to be put toward marriage arrangements to the well-heeled but dreadfully boring suitors the heiress’ fathers intend for them to wed, and it will atone for any pens that have already been employed to sign away fortunes by using official company social media accounts to publicly expose the duplicitous charmers who perpetrated the schemes as the lowborn bootleggers and scoundrels they truly are. As nice as it is that Montblanc is trying to do right by its customers, it’ll definitely take some time to live this down. Getting back on top of the luxury pen game is going to take real work after a boneheaded slipup like this.